It was a strange week this week. 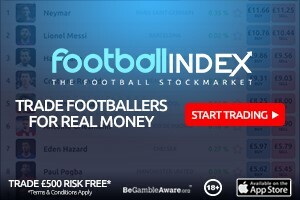 I gained just under 1000 places yet had a gameweek rank of over 1.1m with only 5 returns. 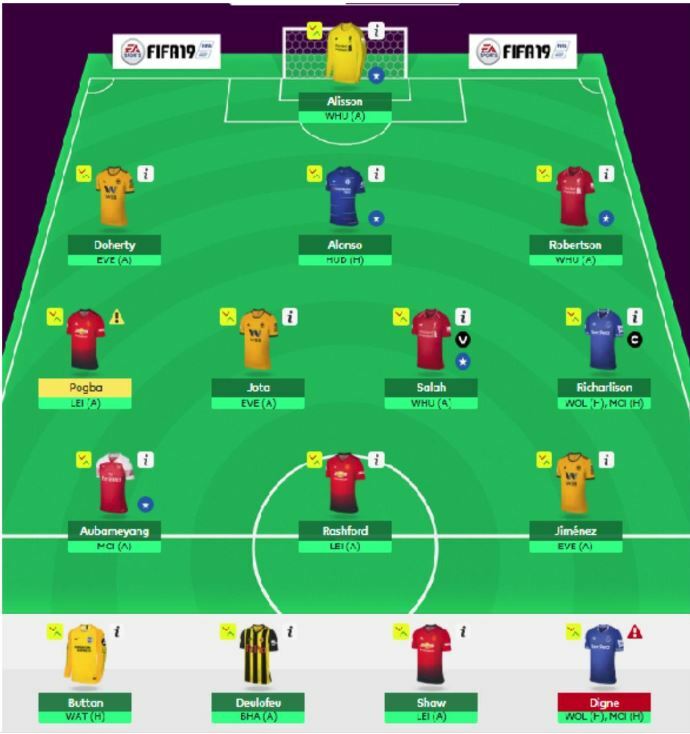 My 5 returns were Aubameyang 12, Jimenez 12, Richarlison 8, Pogba 7 and Doherty 6. Disappointingly Salah blanked which was my first captain blank since gameweek 14 and once again Liverpool conceded losing me 2 potential clean sheets. Digne gave me a -2 by not starting and then getting sent off and bemusingly Chelsea conceded 4 meaning Luiz scored 0. All in all though, even with those negatives it was a good week as I got a solid green arrow. With the double gameweek upon us and having 2 free transfers coming into this week, my transfers are all about maximising my double gameweek prospects. The most obvious transfer for me was Aubameyang to Aguero who’ll I’m very confident will at least start 1 game and play in the other, though I’m hoping for two starts. The second transfer for me was a bit trickier as I really was unsure what other Man City player I wanted. I looked at doing a -4 with a defender being transferred out but there weren’t really any viable choices that made it worth it to me. I ended up putting a poll on twitter about which 2 would be better starters for GW25 with 3 options: Sterling + Wan-Bissaka, D Silva + Richarlison, B Silva + Richarlison. It ended up being 48, 33, 19 respectively which really didn’t help things as I’m confident in saying the majority who voted B Silva would vote D Silva over the Sterling option. In the end I just went with my gut instinct along with the fact that 4 games is better than 3 and went with David Silva for McNeil. My future plans are next week I’ll do Aguero back to Aubameyang and then most probably it’ll be Silva to Son the week after as that’ll give me the 11 players I need for the blank gameweek with Richarlison, Digne and Luiz being my players with blanks. Then it will probably be all about preparing for double gameweek 32 and trying to maximise my double gameweek players. Or alternatively preparing for the blank gameweek 31 then using my free hit in the double gameweek, I’ll make my decision nearer the time. Speroni is the sub goalkeeper as always. 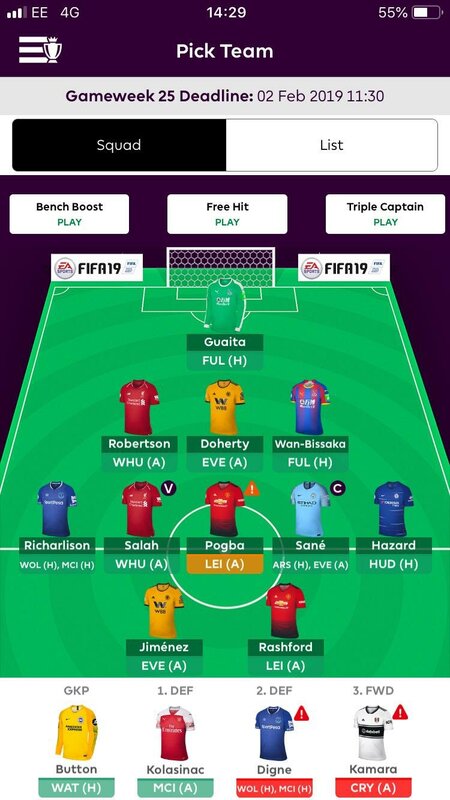 My first sub is Wan-Bissaka though I am contemplating whether to put him in over Doherty but as things stand Doherty is starting. Thanks to Digne’s red card he’s ended up making his double gameweek into a single gameweek against Man City so he’s my second sub. Finally Puncheon is my third sub with him playing Chelsea away. I’ll be captaining Aguero this week with him having a double gameweek and with him being most likely the most captained player. It was a sizeable red arrow during the midweek fixtures for Dier-bolical XI, my 10th in 13 gameweeks, but it could have been even worse if hadn’t made unexpected transfers late in the day on Tuesday. My original plan had been to make a goalkeeper transfer, but after Hodgson revealed that all of his keepers were fit to play in his presser, I decided to hold off on that move. Fortunately Guaita started and it enabled me to make the late transfers of Pogba and Kolasinac in for Anderson and Alonso which was an initial success with a goal and assist between them. The only other returners were Doherty and Richarlison with nothing but disappointment from the remaining players – especially Digne, but the less said about him the better! 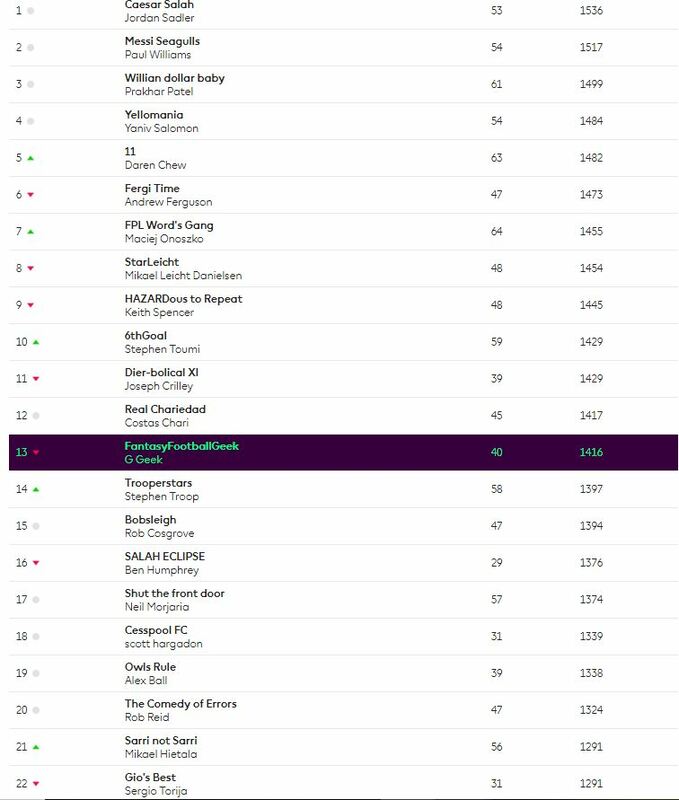 In the end, it was a 18k red arrow with the only saving grace being that I still reside inside the top 100k and double gameweeks are now upon us! The suspension for Digne is one of a number of issues that I have in my squad this week including a couple of injuries and out-of-form players. Eddie Howe revealed that Wilson would be out of action for the next 3-4 weeks following knee surgery while there were worries about Pogba after he was seen limping following his midweek game. Meanwhile Hazard is really struggling for form following his 5th game without a goal and Chelsea seem to be a bit of a mess in general. Fortunately, Solskjaer has suggested that Pogba will be fine for the weekend which gives me one less headache to deal with. When walking through the remaining problems, the Digne ban doesn’t seem so bad given that I can simply play Doherty this week and hope the Everton man is back in the team for GW26. Hazard is an expensive issue, but he is facing a promising fixture this weekend so I will likely give him one more match to redeem himself before moving him to Son or Aubameyang. That leaves the injured Wilson who has been an ever present in my team since my GW4 wildcard, but now seems the time for him to leave my side. There was an option to bring Aguero in by using Hazard as the fund raiser, but I have instead gone for the simple straight swap of Jimenez who has form and fixtures on his side. There is still the temptation to bring Aguero in for Kamara as part of a -8 with Hazard, but I’d likely have to use the triple captain on him to warrant that move. I actually haven’t completely ruled out this option as I can see City bouncing back strongly, but for now I am holding off. This means that the armband is on Sane; I do fear for the minutes of every City attacker but I simply have to captain someone with a double gameweek! The triple captain is still on my mind with it looking tricky to find another double to use that chip in, but I am yet to be convinced. 54 points this week with a poorly minus 4, 8 points above the weekly average, and small green arrow to 17k. 5 returners, all in attacking positions, Jimenez kept his good form with 2 goals, Auba with goal and assist, Pogba and Jota my 2 transfers in gave a goal (penalty) and an assist, and Richarlison finally with a goal after 4 consecutive blanks. Rashford was the only attacking player not to return. My only defensive player with a CS stayed in the bench with another poor decision this week. 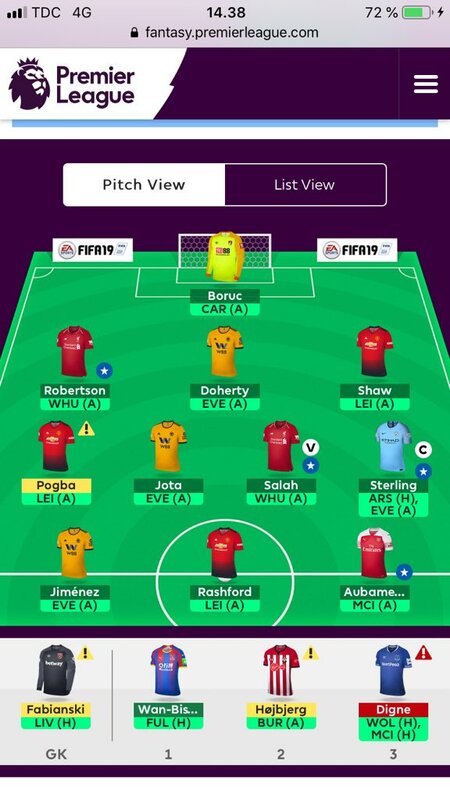 I can count 3 bad decisions this week that cost me a total of 24 points, I wanted to captain Auba and not Salah but was afraid to do it (10 points), changed in the last day Doherty to Digne (another 8 points), and did -4 to bring in Pogba for Son (early transfer, as I forgot about the cup in the weekend and thought that Son will not be there in time even if they lose (as they did). So Son who plays like a striker now gave 6 more points than Pogba with minus 4 , so total 24 points from 3 bad decisions, I hope I will get better calls in the next few weeks. So this is a very tricky now, the first DGW with 2 teams plays twice, City and Everton. City has Arsenal (H) and Everton (A) and Everton has Wolves (H) and City (H). The main problem with City assets is that they have 3 important league game in 8 days and the first and the third is vs top 6 team, so I can see big rotation in the mid-week game vs Everton which can make the DGW non relevant. The other problem with a City assets is that after this DGW they have Chelsea in 26 and then a BGW so if you bring in a City asset so you will have to transfer him out after a week, and that is 2 subs out of 3 before BGW in game 27. 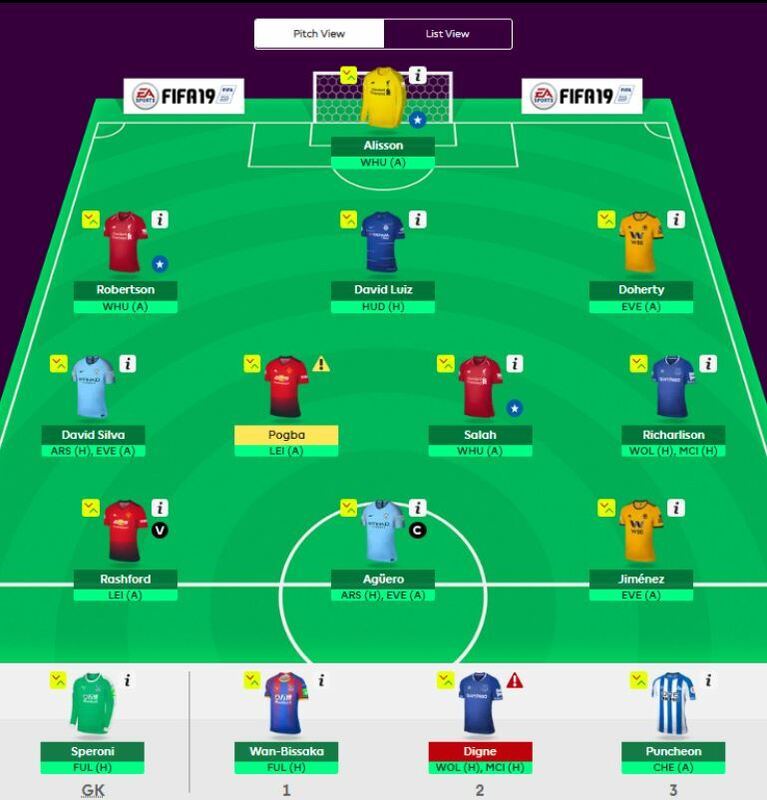 As for now I have already 3 players with a BGW, Alonso, Richarlison and Digne, and more than that 3 United players will face 3 Liverpool players (3 of them in defence) and this don’t look so good, so there is a chance that I will not do a transfer at all, or for example move Digne out (will play only against City) for a player who has a game in GW27. I think that in this time of the season you need to make decisions looking forward for at least 3-4 weeks ahead and not look only for the next game week. For now, if I will make a sub for a city asset it will be Kun for Auba. It’s between Deulofeu and Jota (if Pogba will not play both will make it in although the press conference news is positive). Very interesting issue this week, if I will get Kun he will have the armband only for the chance he can play 180 minutes. If I don’t do that kind of transfer, it will be between Salah and Richarlison, yes Richarlison! Not like the City assets, unless a sudden injury he will play 180 minutes at home, and I can see him returning at least once (although the second match is against City), and 1 return in 2 matches will probably give him double digit points. For now, the armband is on him! Good luck all and have a lot of green arrows! Cant really complain as I got everything wrong and still managed a slight green arrow. Captain: Wrong. Salah gave just 2 points. I wasn’t going to do any transfers if Liverpool won. I believe that if they extended the gap to 7 points by having Salah, Van Dijk and Firmino I would have benefited a lot from the momentum that was going to built. So now I will go the other way around. I am switching Firmino to Aguero with the extra funds I have in bank. Doubling on Man city with Sane and Aguero for the DGW. I will probably take a hit next week and offload them to Aubameyang and Son/ Eriksen…. Captain: Aguero all the way. I believe Pep will be cautious with rotation as they cant drop any more points and will field his best 11 on both games. Aubameyang’s double-figure haul last week was (I think) a bit misleading, as Arsenal have been a bit bland on the attacking front. Aguero was the obvious choice, and this double gameweek is especially enticing because of Arsenal’s defensive crisis. Armband goes to Aguero 100%, and I am tempted to play the triple captain chip as well. Digne will be getting shipped out, but I am not sure if I will replace him with Doherty (good run of fixtures) or Danilo (double GW and recently on Peps good side). I could still change my mind on this transfer though.. There’s always too much time for tinkering.